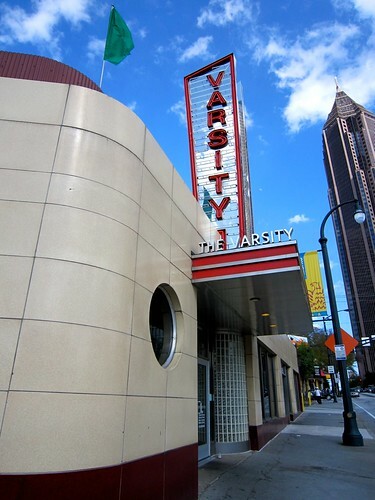 The Varsity is indeed a massive space- and oddly located in the middle of downtown Atlanta, though since it’s been around since 1928 I’m thinking the city grew up around this great establishment. I had posted a quick photo of the sign when we were on our trip, but when RetroRoadhusband and I got stuck in traffic we were glad to have an excuse to stop and explore this giant burger stand. And with their parking for 600 cars, there was a place for us for sure. “What’ayahave? What’ayahave? 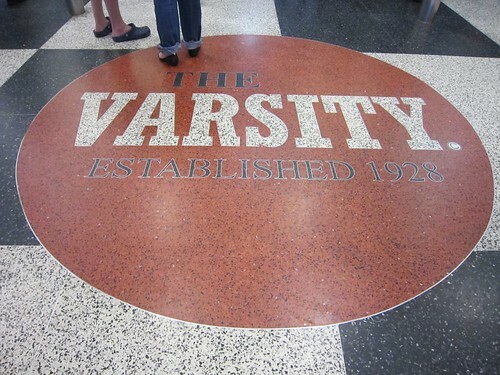 What’ayahave?” – this is the singsong call you’ll hear when you step into the Varsity. If it’s your first time it can be a bit offputting because you’re thinking, “I have no idea what I want! What the heck is a slawdog?” Step aside and peruse the menu to figure out if you want a Slaw Dog, a Glorified Burger or other unique items from their “lingo-ified” menu. – and they say us Northerners are “chop-chop!” ha! I did not have room in ma belly for another bit of food (we had just come from Mary Mac’s Tea Room) but the volume of cars in the drive in bays, the multi-level garage and in the various rooms of The Varsity lend credibility to this place being the destination for quick food done right. 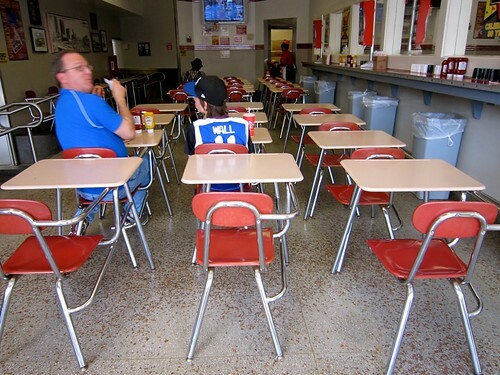 I could not help but call this room “The Classroom” – where you could study the latest game and wash your Yankee Dog down with a F.O. at the same time. Though I surprised this dad when I took my photo, I promised him I was just some wacky gal snapping photos, and it was neat to see him there with his son after whatever sports game they had attended. 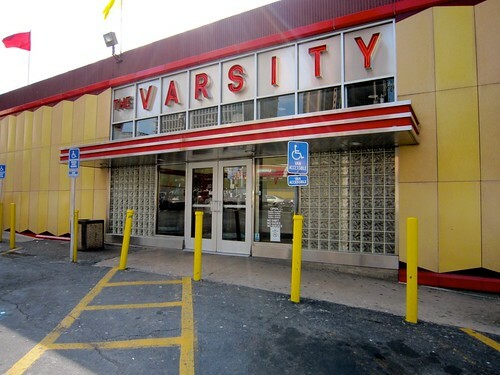 The Varsity is on the t0p 10 list of Retro Roadmap Worthy places in Atlanta- now you can brush up on their menu and know “what you’ll have” when you visit ’em!